American Talmudist; born at Brest-Kuyavsk, government of Warsaw, in 1799; died at Keokuk, Iowa, in 1864. While still a young man he settled in Kurnik, Prussia, and consequently he sometimes called himself "Joshua of Kurnik." In 1854 he emigrated to America, and was appointed rabbi first at Newburgh, and later at Poughkeepsie, after which he retired from the rabbinate. Joshua has justly been called "the father of American Hebrew literature." 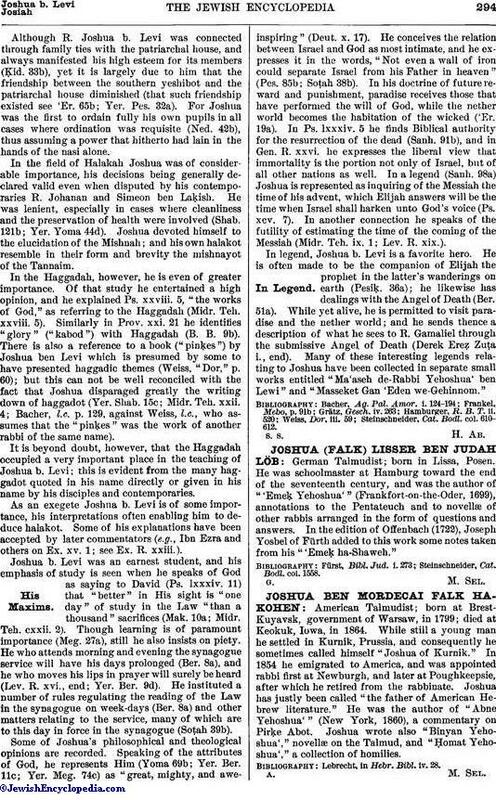 He was the author of "Abne Yehoshua'" (New York, 1860), a commentary on Pirḳe Abot. Joshua wrote also "Binyan Yehoshua'," novellæ on the Talmud, and "Ḥomat Yehoshua'," a collection of homilies. Lebrecht, in Hebr. Bibl. iv. 28.